William Yun Violin - The Jopa String Quartet. Over 30 Five-Star Reviews online and many more referrals upon request. We strive to provide the finest Live Professional String Music Entertainment in Southern California. For booking please contact at show contact info or please visit our youtube channels / websites. Private Events, Weddings, Concerts, Corporate Events, and Recordings. Top Rated, Highly Trained and Experienced Musicians and Service. Booking is only guaranteed via William Yun and Jopa String Quartet's websites, despite other websites featuring William Yun in videos and advertisements. All fees go directly to the musicians, so we do not have to tack on extra manager or administrative fees to our clients. Solo Violin, Duo, Trio, and String Quartet available. William Yun received a Master's Degree in Violin Performance from the San Francisco Conservatory of Music, and B.A. from UC Berkeley. He has over two decades of professional experience playing all types of private events, concerts, weddings, both as a featured soloist and with orchestras and other professional groups. 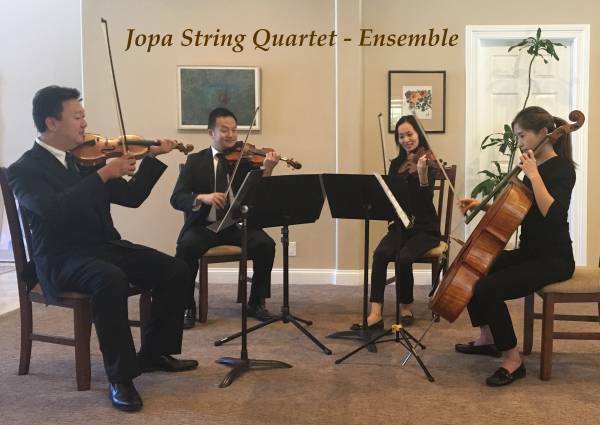 The Jopa String Quartet is comprised of highly trained and passionate musicians who collectively have decades of experience playing weddings, private events, professional concerts. We have played professionally together for many years. We are not an agency that puts together unknown or inexperienced musicians or students who have not played together regularly. We strive to bring the highest quality live string music available for our clients. For booking please contact show contact info or please visit our website / youtube pages. Thanks for reading and best wishes!